Before I begin I would like to thank all of you who have been so generously donating to our school. Our school stays open and running thanks to individual donors. You are amazing people and have done so much for us. Thank you. This report is about a hidden problem that we are facing and we would like to tell you all about it. As we care for children who have very complicated and life-threatening illnesses, we have to provide them with proper medical care. These include correct drugs, Magnetic Resonancing (MR) and Cat scans for severe epilepsy for one young girl Srey Ka* and psychologial support and MR for her older sister who was sold into slavery by their father as a little girl and severely physically and emotionally abused. She was also kicked in the head by a cow leaving her in a coma without proper medical care while living in her former village before coming to our school. We have some children who were born with HIV and their parents died of AIDS. They did not receive retroviral treatment until coming to our school, this means that their HIV levels became border-line with AIDS. People who have HIV although they can prolong their life and live relatively normally, can sometimes suffer from complications such as specific tumours, almost unique to HIV patients. As you all probably remember, we have our little deaf and blind boy 'Da* who was put in an orphange at three months old and there neglected and abused until he came to our school and began a new life. 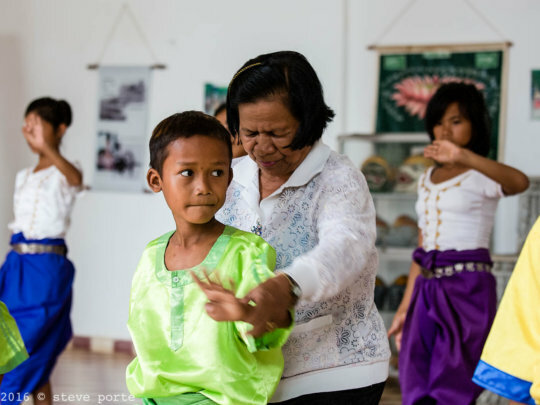 He receives treatment for his hearing disability from the wonderful NGO "All Ears" in Phnom Penh. Gradually his life is being re-built, but he needs constant care and assistance to help him heal and also realise his full-potential. Then we have our children who are blind. Mostly we can do eye-tests and give assistance locally, but one of them a young girl was so severely abused by her uncle that after being hit accross the face by a bamboo cane, she lost the sight of one eye. This eye must be constantly monitored in a proper eye hospital. Eventually her eye will have to be removed and a prosthesis put in place. We live in Kampot Province. There is no Magnetic Resonancing, Cat scan, Pet or Tac. There is no medical assistance or expertise for severe epilepsy, no proper specialists in psychology or psychotherapy. There are no specialists for the deaf and no equipment as such. The nearest eye hospital is in Takeo Province. There are not even anti-rabic injections (Rabies is a problem in Kampot). For each child who becomes severely ill, or who has a life-threatening condition which needs regular treatment, for those who are deaf or have health or sight complications, we must take them to the capital city Phnom Penh 137 km away. We do not own our own car. We must hire a taxi and share it with other passengers and then hire a motorbike taxi in Phnom Penh. Even if we did own our own car, the cost of petrol for a total of 274 km each time we take a child to the capital for treatment, is very high. We are very happy to take our children to receive proper treatment and we would not consider anything less for them, however this necessity requires extra budget support and it has now become really urgent. If you can't find our micro-project, then it's fine to help our transport project and other needs on this project page (Education/Arts Orphan, Disabled Children #16371). If you didn't make it for the 5th October, no problem, our micro-project is running until the end of October. Thank you all for your wonderful support! (* With thanks to the photographer Steve Porte for all his lovely photos. Celebrate our 23rd Birthday and Join us! 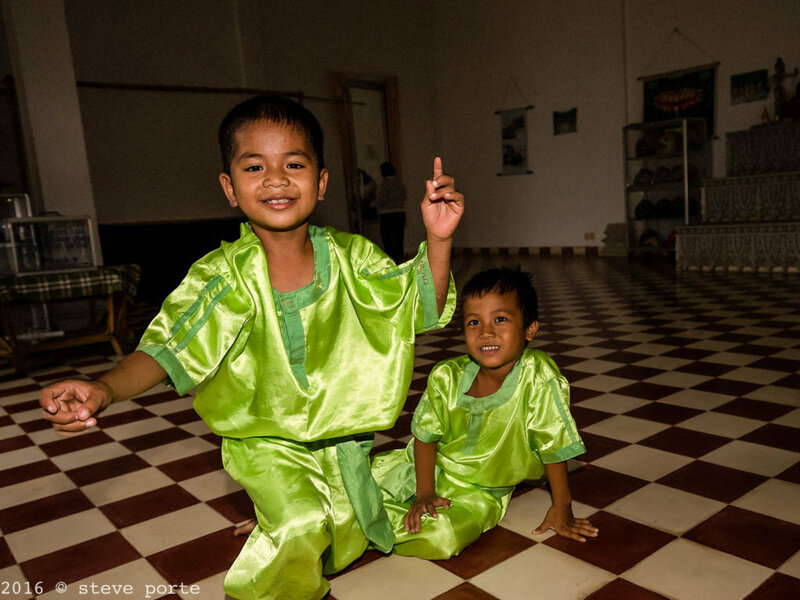 In August 1994, despite civil war in Kampot Province, our school was finally completed and opened. I will never forget opening our doors to children who had lost their parents in remote rural areas to the war. The District Chief of Chumkiri whith whom I had been working, had just been killed by the Khmer Rouge and the ground shook from missiles being fired nearby. Those children who were disabled, had lost their legs to anti-personnel mines or to Polio. Today those children have grown up and have their own children. Some have become professional musicans, others economists, resort managers, some have jobs in government ministries and some are farmers. Following on from them, came other children who also grew up and moved on. Today we have twenty-one children resident at our school, including children who are orphaned and children who are blind. We also have around one hundred children from local villages studying traditional music at our school as well. Where once we taught only Pin Peat music with the last great Pin Peat music master left alive after the genocide we now teach Pin Peat and Mohori music, classical Cambodian ballet, folk dance, ancient Yike theatre and dance and we have revived the art of traditional shadow puppet theatre...once completely lost to Kampot Province. Our resident children have scholastic lessons and are supported through university if needed or to a vocation. We have also developed programs for Peace and inter-relgious and inter-cultural harmony with students from Qatar, Finland and Vietnam. This program also includes helping Cambodian people come to terms with their past and finding truth and healing after the Khmer Rouge genocide. This August we celebrate our 23rd Birthday. We are so happy at this event and we would like to invite you to join us. If you live in Cambodia, you are welcome to our school to our Gala Event on Saturday 5th August from 3pm. You can participate in workshops where our students and staff will teach you the art of making shadow puppets, how to perform them, how to play a Pin Peat instrument and essential dance moves. We will have videos of our school and explanations on the origin and history of our school and traditional Cambodian arts. Watch out on our Facebook page for updates. If you can't make it to our school, you are welcome to join us by participating in the GlobalGiving International Youth Week. From 7th August to 12 August 2017, starting at 9am Washington DC time and ending 11.59.59pm. GlobalGiving will match donations 100%. What a wonderful way for us to celebrate our birthday. Thank you all for your wonderful support and good-will towards our school. Join Our International Youth Week! Please join us for International Youth Week on GlobalGiving from 7th August starting 9am -Washington DC time until 12th August at 11.59.59pm. This is such an important occasion for us, because for a limited time donations to our NGO will be matched 100% by GlobalGiving. So please celebrate the wonderful work our school does. In today's world small local organisations such as ours do not receive foreign government or large NGO funding. The world has changed and funding policies have changed also. This makes it so important for us that our project is supported by raising funds online and creating greater awareness of our work and what is happening in Cambodia. ° Special medical care and transport to hosptial and special centres in the capital Phnom Penh for our children who have complications due to level 3 HIV, severe epilepsy and deafness. ° Continued support for our program for our Blind children so that they can get a proper education. We raised almost a third of our goal on our recent micro-project fundraiser, but we still have two thirds to go. ° Support for our special arts education program: Which revives traditional performing arts and gives our children a chance to become professional artists and to benefirt from the therapeutic side of learning music, dance and theatre. Cambodia is often misunderstood by the West as now being a lower-middle income country and so not in need of aid. The reality on the ground could not be more different. Although there is a very tiny percent of super-wealthy Cambodians, more than seventy-percent of the population live in rural areas. Too many people are dispossessed of their land, or their farming affected by climate change. Basic, essential medical care is lacking. Sometimes people die in agony from menangitis because a rural doctor has misdiagnosed the illness as a migraine. Tubercuolosis is drug resistent and endemic. HIV and AIDS is still too high and many parents abandon their children to elderly relatives so as to earn desperately needed money across the border in Thailand. Cambodia has been pushed by large international NGOs to promote foster care especially amongst extended family members. In theory this is a good idea, because it avoids institutionalised care, which can sometimes be awful. This is based on the model used in the UK and the USA. However recently in the UK it was discovered that an alarmingly high number of children suffered abuse and neglect in foster homes and some were shifted about from home to home without ever settling down. 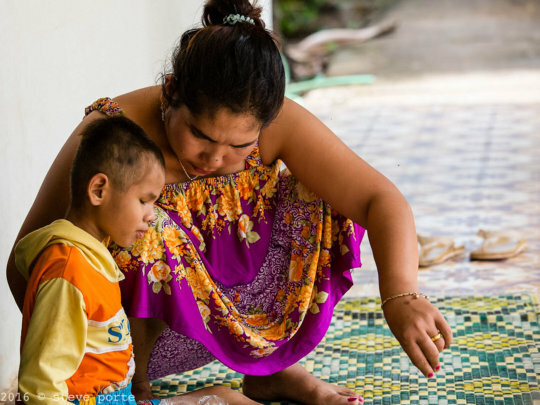 The current reality in Cambodia does not yet support foster care. Although it would be wonderful if extended families or neighbours really loved and took care of orphaned children, this is not the case in many foster homes. Too many children are subjected to abuse, physical and sexual. Others are neglected and many are denied the chance to go to school and complete their education. Socially they are thought of as inferior and used as servants. In April we battled to complete all the Ministry of Social Affairs legal custody documents in time before the Khmer New Year. Why? Because a little girl given into our care must not go back to her extended family. One uncle hit her so hard accross the face with a bamboo stick that he blinded her in one eye for life. She was also sexually abused by another uncle. Another of our girls suffered a psychosis from post-traumatic stress because after her mother's death, her father sold her to a married couple, who beat her and neglected her. She now goes to a pscychologist and psychiatrist. Yet amongst all these tales of incredible suffering and bravery, our school has a beautiful arts program, which is so healing and positive. 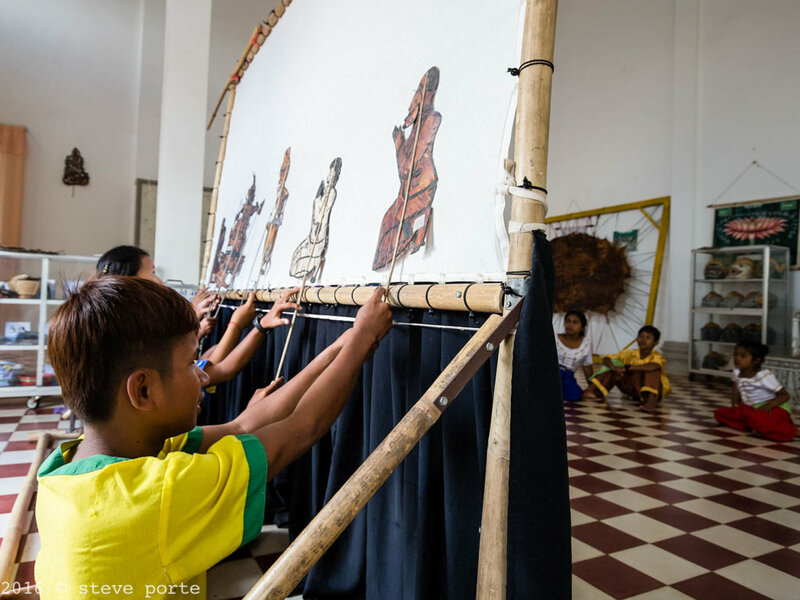 Our arts program on a larger scale restores back to Cambodia traditions which were thought lost after the Khmer Rouge genocide. Imagine therefore the complexity of running such a school as ours. The wonderful Cambodian staff we have who try so hard. Of our children - those who live in our school and have so many needs, firstly as children and then physically if they are ill and because all children need caring for properly. Emotionally, because they are are all in need of love and attention and healing. Then the coordination of getting everyone to their academic lessons...our blind children with their Braille teacher, our littlest one to kindergarten, our slightly bigger ones to primary school, middle school and then lyceum. Then extra English lessons for everyone and computer courses for our blind children. Medical and specialist visits for some of our children. Clothing for everyone...the uniform for school, recreation clothes, ceremonial clothes for performances and pyjamas. 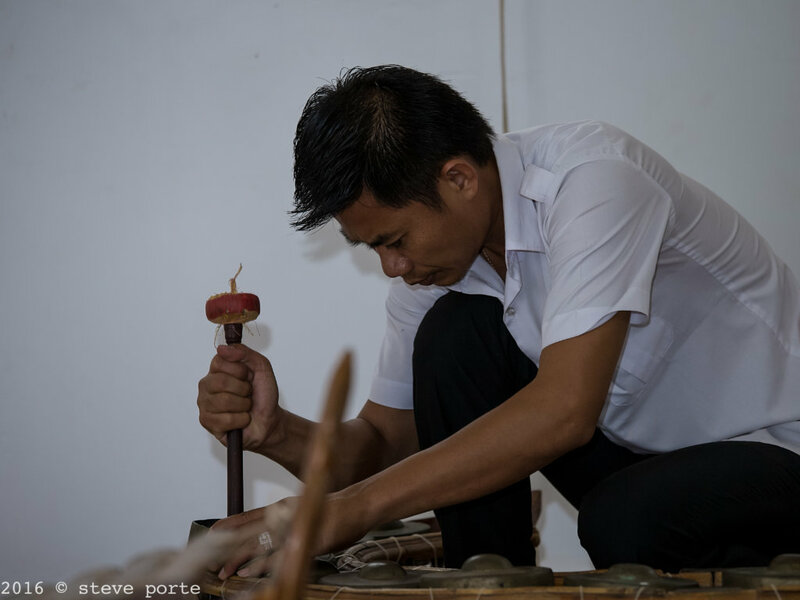 Our performing arts course, traditional Pin peat and Mohori music, classical Cambodian ballet, folk dance, Yike theatre and making and rehearsing shadow puppetry. We don't just teach the children resident at our school, we also give free lessons to around a hundred children from very poor local villages. We also have programs that promote peace and inter-religious and cultural harmony. So we have done exchanges with Vietnam (former enemy of Cambodia). We have hosted and been hosted by Qatari high school students. Most especially we continue to do education and awareness about the Cambodian genocide from 1975-79. Because of government policy (some members of the government were themselves former Khmer Rouge soldiers), the younger generation of Cambodians doesn't know enough about the Khmer Rouge genocide. The trauma from the older generation who survived and the lack of interest by the youngest generation, combined with affectivity problems by the generation in the middle has created a social vacum. There are today severe problems of drugs and substance abuse amongst Cambodian youth, alcholism and gambling addictions across all generations and abandon and abuse of children by high numbers of parents because of post-genocide trauma. We have hosted photograph exhibitions about the U.S. carpet bombing of Cambodia and we have screened for free, films and documentaries about the Khmer Rouge genocide. These are normally visual materials that ordinary Cambodians have no access to. In this way we try and build bridges between the different generations and create understanding, healing and peace. By supporting our school, you have helped and continue to help, this extraordinary richness of multiple projects. You have been helping so many children who vitally require assistance and you have supported the preservation of Cambodian culture. This latter considered World Intangible Cultural Heritage by UNESCO. International youth Week is therefore indeed a real celebration. In August we celebrate 23 years since the birth of our school in 1994. Well done. You have helped so much! *All Photographs of our students and staff were given with their permission and taken by Steve Porte. We have not photographed those children whose personal difficult histories were described in this report. This is because we would like to protect their identity.